Students in Pre-K-8 receive music education for one hour every week. All grades learn the basics of music theory, sight reading, music history, harmony and ear training. SJE also offers choir to grades 3rd-8th. All students participate in the annual Christmas Concert which is a traditional performance celebrating the birth of Christ. Our students perform in the community at various events and at our spring talent show. Additionally, every year, students from our school choir attend the Christian Brothers High School Choir Festival. Students in grades TK-8 receive one hour of fine arts instruction every week. The art curriculum is integrated across all subjects with a focused study of Art Masters and their place in art history. It is rooted in the Elements of Art and the Principles of Design and gives students an experience of a variety of tools, techniques and styles. 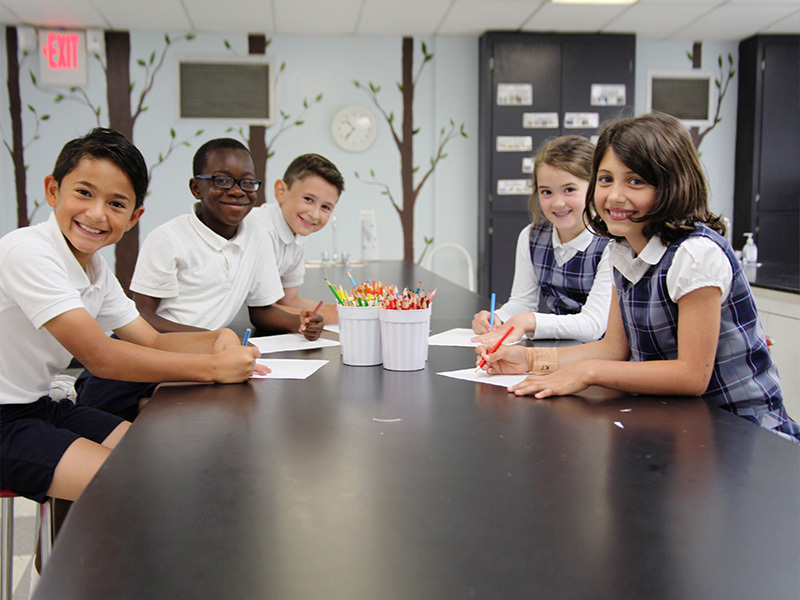 It supports service learning experiences, Catholic faith connections, and fundraising opportunities with artwork from our students. In the 2016-2017 school year, four of our students won contests at the local and national level. One of our students won the U.S. Department of Education and Crayola Contest and currently has their artwork on display as part of a Curated collection in Washington D.C.
Students in grades TK-8 receive Spanish instruction every week, for anywhere from 30 min to 1 hour and 40 min, depending on their grade level. The program is focused on developing the essential abilities for learning a new language, which is divided into two active parts - speaking and writing - and two passive parts - listening and reading. Students will learn the basics of Spanish grammar, vocabulary, and correct pronunciation, while practicing skills to make it more meaningful and useful. Time will also be spent focusing on the Spanish-speaking culture throughout Latin America.